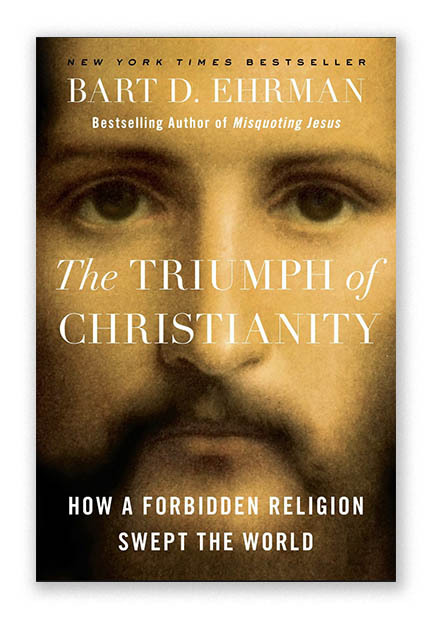 I’ve been reading a provocative book, published within the last year, titled The Triumph of Christianity: How a Forbidden Religion Swept the World (Simon and Schuster, 2018). The author, Bart Ehrman, is both a Moody Bible and Wheaton grad, who once considered himself an “evangelical,” but now does not; he’s not sure he even believes in God anymore, placing himself in the “agnostic atheist” camp. He is certain, though, that Christianity took over the ancient world and birthed a modern one, incredibly, in spite of all the odds. Ehrman is both a historian and a textual scholar, widely respected for his grasp of the ancient languages of Scripture, and his ability to unpack history in a way both academics and a popular audience can understand. He teaches at the University of North Carolina at Chapel Hill. He has authored or edited thirty books, including six New York Times bestsellers. But, for all of that, he is not a Jesus guy. Nope. He does not now believe Jesus lived, died, and was raised from the dead, in the way the rest of us “born-again” types do. For most believers, the answers are straightforward: Providence. God was on their side and He caused them to prevail, even as they faced seasons of extreme opposition. For most unbelievers, the answers are similarly direct, if different: Constantine. The fourth-century Roman Emperor made Christianity the religion of the empire and his subjects followed. Ehrman’s studied analysis isn’t buying either approach. As an “agnostic atheist,” he cannot accept notions of divine appointment. And, as a legit historian, he is persuaded that Christianity would have triumphed over the pagan world even if Constantine had never taken the stage. What are his answers then? First, Bart argues that the exclusivity of Christian allegiance to one God, to one Lord, to one baptism—its monotheistic devotion to one God in a world of many other objects of worship, laid the foundation for triumph. It required people to make a choice, it brought people to a point of decision. The single-mindedness of the early believers in pursuing and honoring their one God was compelling and powerful, in a society framed by multiple deities, all of which could be simultaneously embraced. Christians focused on serving one thing, their God. Jesus was the subject. Period. Bam. Second, he acknowledges the irresistible missionary fervor of the early church. These were people who found life in sharing the life given them by their Jesus-centered beliefs. They talked about Jesus with anyone who would listen, because they actually believed He was alive and, that the more they talked about Him, the more of His power they would experience. Their missionary zeal transcended all economic and cultural classes, elevated the status of women, children, and the poor, and was broadly countercultural, unencumbered by the stiff divisions of Roman social norms. Third, Ehrman is convinced that the early church’s profound confidence in the supernatural power of God propelled its persuasive witness. Remember, Ehrman is not contending that miracles actually took place, but he does conclude that the believers believed they took place. Stories of the miraculous hand of God healing, restoring, redeeming, and reclaiming were shared repeatedly and woven into the community’s DNA. Theirs was not a religion of just theory and ideas, it was a religion of transformational experience. Real. Palpable. Irrefutable. At least, Bart says, the Christians believed it was so. Fourth, the author explains the triumph of Christianity by heralding it a “religion of love.” The pervasive principle of loving God with your whole self and your neighbor as yourself defined a social movement, which befriended the friendless, protected the helpless, fed the hungry, cared for the indigent, and generally poured life into those outcast and on the edges of the ancient world. This drew huge numbers of converts and inspired, over time, the masses. He makes the case that this loving approach to neighborhoods was the original social network of evangelism; no crusades, mass meetings, or door-to-door canvassing brought the triumph of Christianity to pass. No, it was rather the ordinary rhythm of ordinary life, one person opening their heart to another person with a testimony of a living Christ that even the grave could not hold, proved true by personal experience, charity, and a certain generosity of spirit. Fifth, Ehrman says Christianity’s prevailing wind can also be explained mathematically. If every 100 believers simply won two or three converts every year (an annualized growth rate of approximately 2.5 percent), the Christian population would exponentially overtake the Empire. Like compound interest on even the smallest investment, in time a fortune in new believers can be made. And, so it was: from the New Testament’s early census in the Acts of the Apostles of 120 to the likely 25–35 million Christians just a few centuries later, the astonishing growth of the Christian church can be attributed to just the math—at least, in Bart’s view. Sixth, and at last, The Triumph of Christianitymakes the case that Christianity was an “all-encompassing” system of belief, that touched every area of life. Ancient pagan practice tended to be siloed, one deity for this, another for that. Pagan cultic worship was an event, not a way of life. Ethics, personal conduct and relationships, family life, professional pursuits, and so on, were all parceled out in separate religious pursuits and motifs. But following Jesus was just that and only that. It was following Him in every area of life. The Ten Commandments and the Sermon on the Mount became holistic foundations for every question everyday life might pose. “Exclusive, evangelizing, totalizing…”—these are the adjectives with which the agnostic atheist Ehrman clothes his sense of the early gospel. And facing these, the pagan world of ancient Rome collapsed and faded away. Pliny the Younger, a Roman governor in Asia Minor (now modern Turkey) wrote a letter about the Christians he encountered between 110 and 113 A.D.; the letter was sent to the Emperor Trajan, seeking advice about managing this new “cult” of “atheists” (a term the ancients used to describe the believers, because they did not believe in the prevalent [and largely visible] gods of the time). Pliny saw the early church as a threat to the established order and an offense to the gods he understood to protect the realm; he hauled Christians into court to dare them to recant their faith or face execution. Pliny’s letter is an important glimpse into early church life, written from an unbeliever’s perspective. He determined that the Christians “came together to worship at dawn and sang antiphonal hymns to Christ as God.” They also “bound themselves by oaths to engage in highly ethical activities: they agreed to commit no crime, no theft, no adultery; they agreed never to break their word or to withhold money from someone who had deposited it with them.” The Christians would then disband and “gather again later to share a meal together.” Sounds a lot like the imperatives of Hebrews 10:23–25. Pliny nevertheless viewed the early Christians with disdain, labelling their faith a “superstition,” which had infected “many of all ages, every rank and both sexes,” not just in cities, but also, “through the villages and country areas.” Local pagan temples were becoming ghost towns and there was little demand for sacrificial meet (the product of ritual pagan worship). Whatever Pliny thought or Ehrman thinks, I would argue that there was—and is—a divine appointment at work in the Church of God: in the first, second, third, and fourth centuries and in the present one. It is God’s business, this ministry of Good News, reconciliation, and reclamation. But, Bart Ehrman’s observations have merit, too. For they underscore, on the evidence of the historical record he so carefully curates, that the New Testament definition of church life works. It worked then, and it works now. Perhaps, as we celebrate another Easter this month, perhaps, as we wrestle with how to be salt and light in an increasingly post-Christian, almost pagan world, perhaps, as we think and pray about what to do next as a Movement, we should focus on the elemental. Is our walk with Jesus so real we can’t help talking about it with others? Can we identify our social networks and begin to infuse them with talk about a Jesus we actually believe is alive? Do we not only believe in miracles, but have stories to tell of God’s intervening supernatural power in everyday life? If every church of 100 (or 50 or 1,000) set its sights on growing by just 2.5 percent each year, we would, as a Movement, grow by 15 percent in just six years. Is there one person this year you can invite to Jesus? And, if our relationship with Jesus is not electric enough to make our witness impossible to restrain, how do we rediscover Christ in community, learning anew how to experience Him, not just know about Him? How do we focus our hearts on a fresh filling of the Holy Spirit so that the world around us cannot help but see the difference? Before we first think about “building the church,” how do we first think about “loving our neighbor as we love ourselves?” Would not our churches expand if our love for our neighbors authentically expanded first? And, what of the poor, marginalized, and vulnerable—the curbside of society Jesus seemed perpetually prone to visit? Will there be a book written someday about The Triumph of Christianity in our age? I pray so. I believe so. I’m beginning to rethink the part I must play. How about you? Be encouraged. Jesus is, indeed, our subject. And, He lives. He leads. He loves. He is with us. I am looking forward to seeing you at the Church of God Convention in Orlando in June and counting the days. Be there or hear about it. Be there and give life.